My honey Magnolia: Blog Hop and my first Box! Ciao ragazze.. oggi sono onorata di annunciarvi che inizia il secondo blog hop sponsorizzato dalla Magnolia! Come tema abbiamo scelto Primavera/ Pasqua ma chi ė l'unica pataccona che ė a 500 km di distanza da casa e non ha un computer a disposizione per inserire le foto ???? Io!! Eh si sono in trasferta a Torino ma non mi sfuggite torno a casa nel pomeriggio! 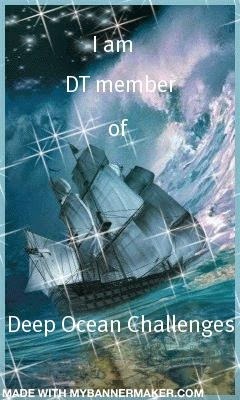 Quindi intanto potete lasciare il commento per il blog hop a questo post e se vi va tornate nel pomeriggio a dare un occhiata alla mia creazione! Vi dico già che ė una scatolina..
Hello girls .. today I am honored to announce that begins the second blog hop sponsored by the Magnolia! Come on, what are you waiting to join? As a theme we chose Spring / Easter but who is the only stain that is 500 miles away from home and does not have a computer available to insert pictures?? I do! Oh yes, i'm traveling to Turin, but I escaped I get home in the afternoon! So in the meantime you can leave comments for the blog hop to this post and if you like you can come back in the afternoon to take a look at my creation! I tell you already that it is a box .. 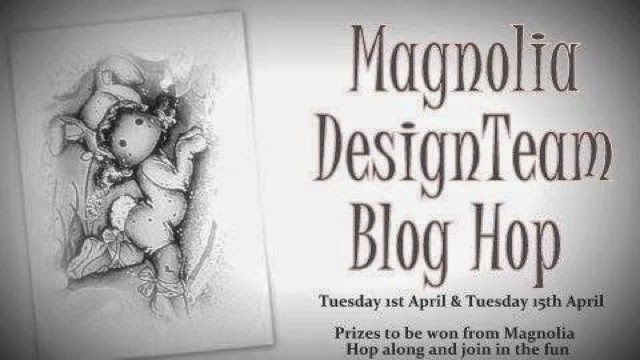 I cant wait, i love these magnolia blog hops! tuo lavoro con Magnolia e stupendo. I'll be back .... I love all your creations anyway. Fantasticissime creazioni!!! Ti seguo anche su IG!!! Troppo bello il tuo modo di creare! Je repasserai pour voir le final de votre création. Je peux déjà dire que vos boîtes sont superbes. I will certanly be back later, you make gorgeous cards! Ohhhhhh.....love the boxes and the suspense!!!!!! Love your work! Sei troppo forte...il bloghop con attesa finale!!!! Non vedo l'ora di vedere cos'avrai realizzato...e non correre troppo! Can't wait to see the inside of the boxes! what is inside the box ?? Looks beautiful, such gorgeous papers! I am curious what's in the box! The boxes are really great, I love the papers! Le tue creazioni sono sempre bellissime!! Brava giada!!! I love your boxes, and can't wait to see the finished creation! Pretty boxes! Can't wait to see the finished project! Complimenti giada! Ti seguo sui facebook! Le scatole sono bellissime....c'é una fustella che serv ve x realizzarle? ....magari vimcessio qualcosa! 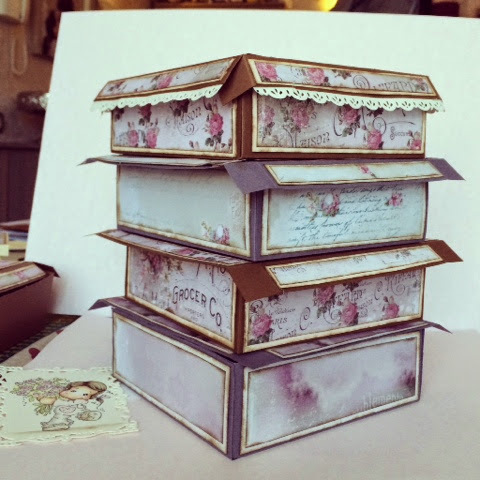 Gorgeous boxes, Giada! Love them! Thank you for sharing and I have fun to join the hop and see all those fabulous creations! Enjoy your travelling and I'll come back to see your wonderful creation. Great Job! I love the DSP you used!! happy Easter! E' davvero meravigliosa....direi che è valsa la pena aspettare e tornare per vederla!! !Buona Pasqua! This is a spectacular box with the loveliest details and the cutest Tilda!!!! Outstanding job!!!! Questa creazione è veramente bella! Voglio questo timbroooooo!!!!!!!! Adorable box, Giada. Love how you colored Tilda and fabulous design. Your box is amazing! You did a fabulous job. Just love it. How awesome. I think I need to try making some boxes! So cute!!! She's my favorite. Love the embellishments and the layout. Such a gorgeous present box. Your box is absolut sweet and beautiful.Love it! Giada, it's a very beautiful box, I love the swedish lace on the side, it makes it look so versatile. And your coloring are as stunning as ever. Happy Easter to you and your family. Wow this is Stunning! Such a Gorgeous box and my favorite Colours! Hope you have a Lovely Easter! what a beautiful box! Such a cute Tilda you've choosen. Happy easter. What a lovely box! Such a beautiful image you've made! Magnifique cette boîte, superbe travail, bravo, j'adore!!!! Wow Giada, it was well worth the wait, I finally made it back and I'm not disappointed! This is stunning, your colouring is perfect and love the beautiful details especially that chunky frantage! Awesome box you have made. Really nice!